Background: This study is aimed at evaluating the content of mercury in 17 samples of beauty creams. These beauty creams have been procured from local market. 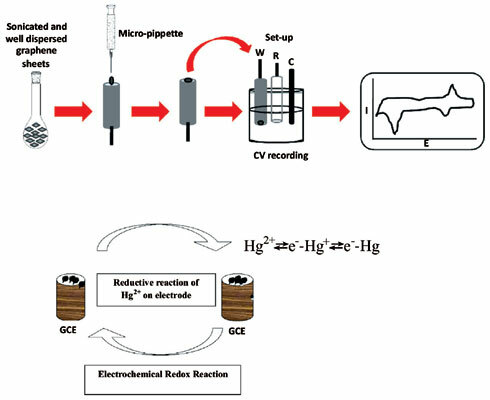 Objective: The potential use of graphene modified glassy carbon electrode in electrochemical detection of mercury ions present in beauty cream samples has been demonstrated. The content of Hg was measured by electrochemical method. Method: The analyses were preceded by acid digestion of the creams and Scanning Electron Microscope and Raman spectroscopy was used for characterization of the samples. The quantification of Hg was performed by graphene modified glassy carbon electrode. The presence of graphene sheets on the glassy carbon electrode greatly enhanced the electrochemical response for mercury. Results: The electrode’s performance was accurate and sensitive for the detection of mercury ions in real samples. Cyclic Voltametry measurements showed a well-defined HgCl2 redox peaks present in control. Detection of Hg2+ was achieved in the range of 5 mM to 10-7mM with a limit of detection of 10- 6 mM. The performance of the electrode was also studied by recording nyquist plot for the sample cream which showed the maximum presence of Hg2+. Conclusion: The results of the creams showing the presence of mercury were also confirmed by the Atomic Absorption Spectroscopy (AAS).Therefore, our method is potentially suitable for routine mercury ions sensing in beauty cream samples. The fabricated device shows good electronic stability, excellent lower detection limit and high sensitivity for real-time detection of Hg2+ in beauty creams. Electrochemical, cyclic voltametry, Hg2+, glassy carbon electrode, graphene, mercury.